Story Cubes – Game Night Carnival! Rory’s Story Cubes is a very VERY free form game. This is a great one for all ages, and has several added bonus uses. There are nine cubes (six-sided dice) with random, but interesting images on them. These include a pyramid, the moon, a keyhole, fire, an arrow, a footprint, etc. The basic concept is to roll the dice, and make up a story with the images presented. You can play this any number of ways. My wife and I tried rolling them all at the same time and taking turns selecting a result to describe the next piece of the story. Another way to play is taking turns rolling one die at a time, and making up there story as you go along. Since there are an odd number of dice, whoever started with less got to choose the title of the story. Our stories tended to be a bit ridiculous, but that’s mostly because we really enjoy cracking each other up, usually sporting terrible British accents. Don’t judge. We had a great time with this game, and heartily recommend it if you feel like doing something with no rules to speak of. This is also the reason it is a great game to play with young children who tend to make up the rules as they go along anyway, regardless of the game. It’s a great creative activity to flex your improv muscles in your brain. Which brings us to bonus uses: The obvious one being that these can cure writer’s block. Aspiring novelist? Stuck on a scene? Roll! Oh, what’s that? Your hero boarded a plane that was hit by a shooting star which catapulted him to the moon where he discovered the moon-pyramids that was inhabited solely by space-turtles? Fantastic! If you’re a brave and talented Dungeon Master, the other excellent bonus use for these dice is to use them to improv during an RPG session. As detailed by the illustrious Dread Gazebo, Story Cubes can be an excellent addition to your dice bag, either in the dungeon design process, or during play if your player’s veer off-course (surely, they would never do that!) you can throw them a curve ball. This is a new twist on the old adage of DMs rolling dice behind the screen, making stuff up; sometimes the roll matters but sometimes the DM is just buying time, thinking of what to do next. Now you’ve got something to help you wing it! Story cubes is also an app on iOS. While $2 is certainly more cost effective and portable, I feel the $9.99 MSRP is worth it to have the dice in hand. I’m unaware of an android app for this, but if one of our readers knows of one, feel free to set the record straight in the comments! This post is part of the monthly Game Night Blog Carnival started by Roving Band of Misfits. Why not check out their review this month of Carcassone Castle! Morrus over at ENworld did the RPG community a great service by starting this tumblr that provides a list of RPG-related kickstarters going on at the moment. The project organizer must apply to be added, so there shouldn’t be any kind of unrelated weird projects that slip through. That being said, there are a lot of other really cool kickstarters going on that have nothing to do with RPGs, but it’s a great filter to find projects that are gaming related. In other news Brian Fargo, creator of the Wasteland 2 project, has started a very cool movement called Kicking It Forward. 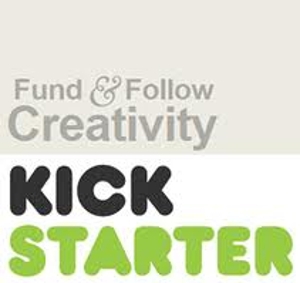 It is essentially similar to the Pay it Forward movement of about a decade ago, but instead of acts of kindness, project creators agree that if their project is funded, they will donate 5% of the projects proceeds to funding other kickstarters. This is pretty much saying, “Hey, we made this awesome thing happen, let’s see if we can make YOUR awesome thing happen.” I think it’s a very cool concept, and will help insure the continuation of the thriving community that backs these great projects. Thats all for now. 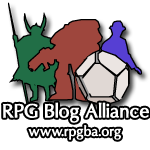 Remember, March is the RPG Blog Carnival about crowdfunding and crowdsourcing RPGs, so if you’ve got a blog, and a take on how these new developments are affecting the hobby/industry, get to writing! The month is almost up! Some of you as old as I am might remember this…. To many folks, this game was their first exposure featuring such a setting (though other games, such as TSR’s Gamma World, had been on the market for years at this point). Video games reached different audiences, and as we looked down the barrel of our ICBM’s at Russia in the 80’s, this game was… relevant. 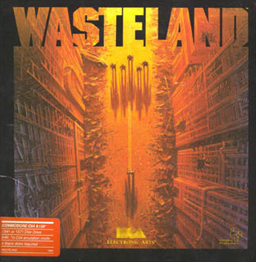 Still, for a video game, there wasn’t much going on until Wasteland came on the scene. It’s fans are legion, and despite decades passing, a recent Kickstarter has shown that mutant dreams really can come true. Brian Fargo, founder of the video game company Interplay, has used Kickstarter to bring to life a long running dream of resurrecting this franchise for PC and MAC users (with rumors of a possible tablet format before they’re all done). After numerous rejections in the now very corporate world of video games, Kickstarter is allowing good ideas like this to get off the ground and circumvent corporate greed that has killed so many good and beautiful things. (Insert lost cause here). It makes me wonder what the possibilities might be as this idea begins to evolve. Certainly, there is the opportunity to fund great ideas by small entrepreneurs, building an empire of the New Creatives that can produce their untainted dream product. While there may be some instances where editing and oversight are good things, we can see lots of examples where the “suits” have trashed a really great idea based based on policies, surveys, polls, marketing reports, etc. But maybe there’s also the distinct possibility of a market flood when all this potential for funding gets out (which, you know, is happening right now). You have to presume that people will spend their hard earned dollars on the best ideas, and apply liberal common sense. Maybe I’m just too cynical, however, but I wouldn’t be surprised if we see slicker promotional videos in the future promoting less phenomenal products. The potential for a smoke and mirrors vaporware product seems high, considering that many might aspire to do more than anyone realistically could, money or no money. We’re seeing a moment in economic history where technology has risen the consumer/producer relationship to its most perfect state in human history. Will it unleash a monster? Will corporate greed somehow insinuate itself into this process? Will the system get glutted with Edsels? Or will things continue to grow and improve in ways that we never thought they could? I’m holding my breath for a Cadash 2, Kickstarter… Let’s see that. Our submission is complete! Tomb of the Sea Dwarves is available on our downloads page, and will eventually be available at the contest site. We’re listed as Kevin Heuer and Michael Jones, as I wrote it, and Mike did all the layout and cartography. The original adventure was about 12 pages long. I would publish that, but it’s full of really excellent artwork of which we have no legal right to distribute. The original adventure had a few more encounters, and was written for our particular group who had, in the course of their adventures, managed to buy a tavern. But despite all the specific tailoring to our group, I had to cut a lot of background information, context, and details about the environment. In the end, I don’t really mind. It leaves a lot of interpretation for the GM, and a lot of flexibility to drop this adventure in just about any city environment. It seems like the trend of recent adventures is to provide a lot of specific details, both “crunch” and “fluff.” If you look at old adventures, a lot of them provided very few details about any particular room or encounter, instead providing a lot of rooms and encounters. One could argue it’s the classic argument of quantity vs. quality, but I feel it allows a clever GM a lot more wiggle room. I guess it really comes down to GMing style. Some feel like everything needs to be spelled out in the text, others can roll with the punches. All and all it’s been an interesting exercise, and I really enjoy the concept of a one page dungeon. I can’t wait to see all the other submissions this year! Because who doesn’t love free stuff? I’ve compiled a list of all the free downloads we’ve offered since starting this crazy blog about 6 months ago. You’ll find some 4e holiday adventures, a massive combat resolution system, and a pretty awesome fumble chart for when you roll a one in a 4e skill challenge. Soon you’ll be able to download our One Page Dungeon for the One Page Dungeon Contest. The Free Downloads page will live at the top of our blog, just next to the ‘Contact Us’ tab. Enjoy! It’s that time again folks! The One Page Dungeon Contest is taking submissions for 2012. I’ve really enjoyed checking out the submissions in previous years, and I think it’s a great source of free inspiration for DMs everywhere. I’m proud to announce, this year Skyland Games will be participating with our submission Tomb of the Sea Dwarves! We’re working on distilling this adventure I created for our old dwarven party down to one page. Taking a 12-page adventure and cutting it down to one is an interesting process. It makes you consider what is truly important to describe in an adventure and what is just added fluff. We’ll post the final version here once it’s all polished up and ready for submission. If you’ve got a great idea for a one-page dungeon, get your submission in by April 30th. If you need some maps or ideas for a game night coming up, check out the previous submissions and the rest of the Dungeon Maps site! It’s the oldest and most iconic form of fantasy RPG adventure. A bunch of adventurers of varied skills and backgrounds stumble across a hidden cave, or an entrance to an ancient tomb. Traps and foul creatures stand vigil over gleaming piles of treasure, long forgotten. I’m prepping for tonight’s Pathfinder Society game. Tonight, I’m GMing one of the PFS intro scenarios, which are free, and pretty awesome. The second one in the series “To Delve the Dungeon Deep,” is about as classic as a dungeon crawl can be. I won’t spoil it for those who have yet to play it (including the guys tonight! ), but this little delve has got it all; traps, mysterious lairs and runes, creatures, and plenty of options for PCs to make choices. Which way? Attack or parlay? Poke it with a stick or run screaming? Recently, I adapted The Lost City for 4e. A classic D&D module, it proved to be one of the most fun 4e experiences I’ve ever had. My sincere hope is that DnDnext or 5e gets back to the classic feel of exploration and mystery. 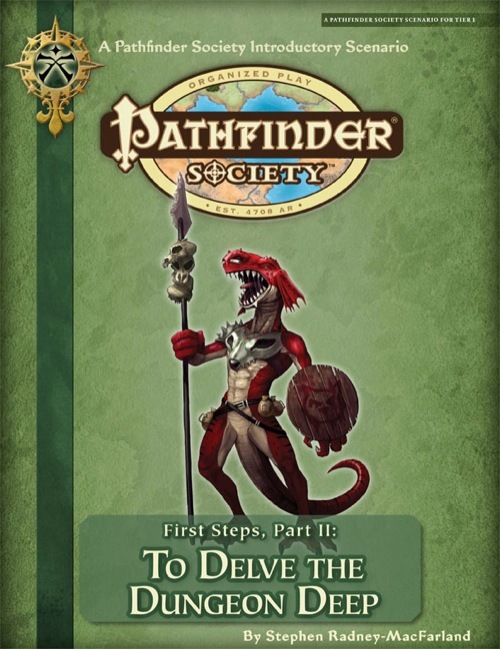 4e as written seemed to get bogged down on the numbers side of things, (making sure encounters were balanced, treasure parcels were level appropriate, etc.) and lost some of the magic that came from not knowing what was behind the next door (let alone if the door was trapped!). If you don’t have access to any old D&D adventures (I’m talking late 70s, early 80s) I recommend downloading Part 2 of the PFS intro scenarios. Heck, you might as well download them all. Even if you don’t play Pathfinder, the style of this delve can inspire a GM for any system. Things to consider: What is the history of the location of the delve? Who used to live there? Who calls it home now? What did the previous inhabitants leave behind? What have the new denizens added? Try and tie them all together with a cohesive theme, a goal for the adventurers (perhaps the classic MacGuffin? ), and you will have at least one awesome night of gaming ahead of you! If it has been a long time since you’ve explored a forgotten place with a group of adventurers, grab a torch and a ten foot pole and conquer the unknown!